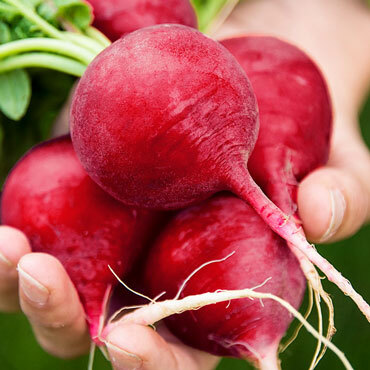 Sweet and mild at any size, this large, globe-shaped radish is 1.5" across with crimson skin and mild white flesh. Best of all, German Giant Parat remains firm, crisp and mild-flavored without becoming hollow or pithy, even at its "giant" size! If you've never planted radishes before, try out our German Giant Parat seed tape. The seeds are encased in biodegradable paper that protects the seeds during germination and dissolves in the course of watering. Simply cut the tape to the desired length, place in the garden or in one of our Grow Tub® containers and water as usual. This way, you'll never have to worry about over- or under-seeding! 29 days to maturity. Soil Preference: Rich, well-drained fertile soil.